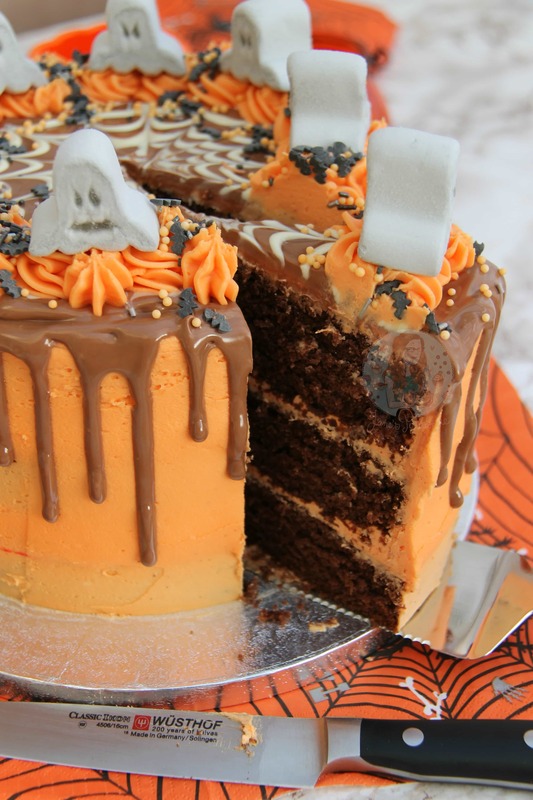 A Spooky yet Delicious Halloween Drip Cake to be the Ultimate Showstopper… Chocolate Sponge, Orange Buttercream, and all things Spooky! I knew I wanted to do a Cake for Halloween this year… But I wasn’t sure where to start. 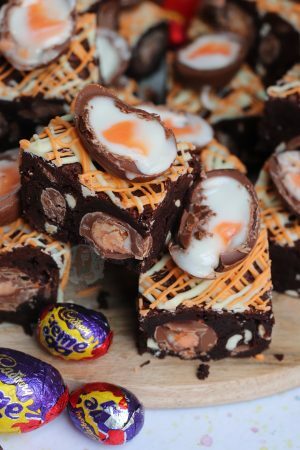 I wanted to make this recipe easier than others I have seen so that more people can make it! I saw pictures of drip cakes, but the drip bit was ‘blood’ or I saw cakes where various creatures and creepies were climbing out of the cake, and these are all AMAZING. However, my recipe had to be easy enough for all, and still delicious without spending a big buck! So, this happened. I realise it’s not actually spooky at all. 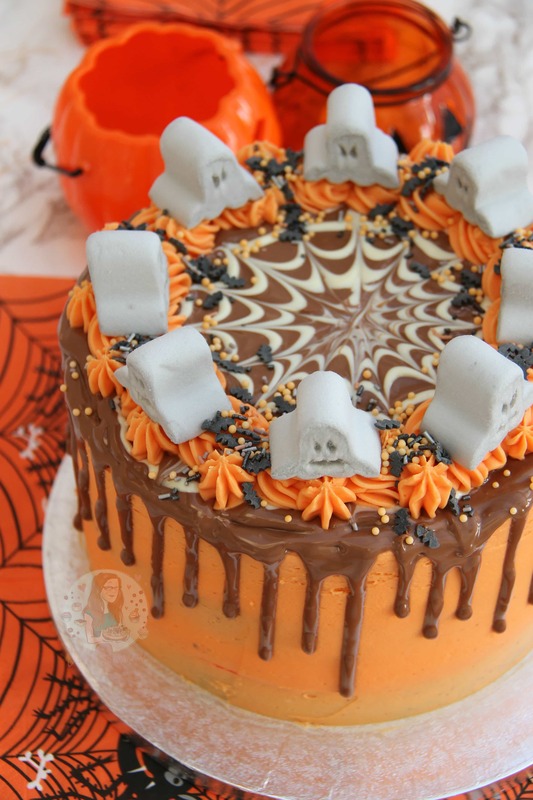 Partly because the Ghost Marshmallows on top are actually more cute than scary, but this is beside the point. I wanted to make it delicious, and that did actually happen! 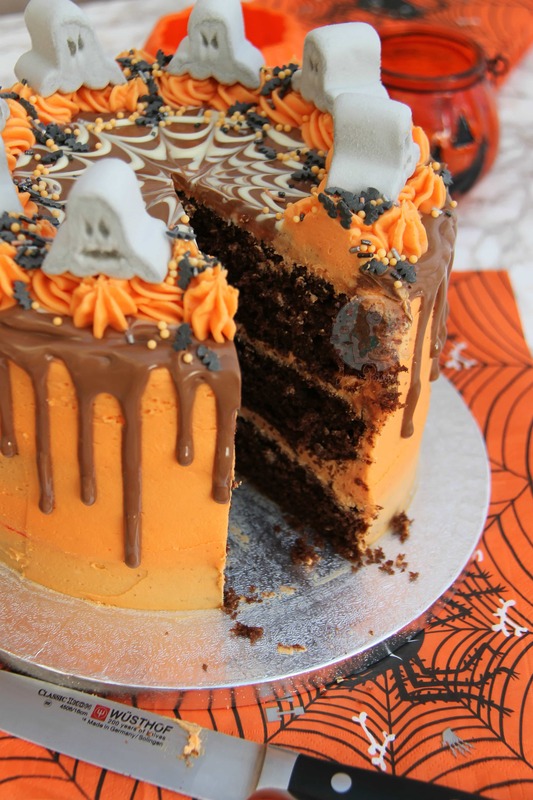 I went for a chocolate cake as I adore it, and I feel like the dark colour of the chocolate made it look slightly more spooky than vanilla cake. I used the recipe for the cake from my Oreo Drip Cake as it was such a success with so many of you making it. 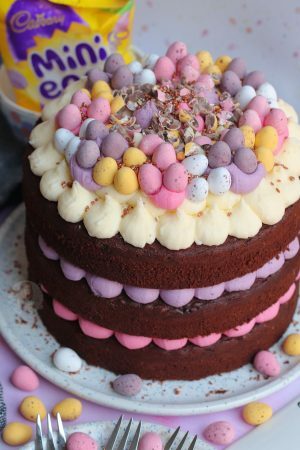 I did, however, notice that everyone loved the cake sponge lots but struggled to decorate it… Sometimes that is because the buttercream is still slightly too stiff, or the sponge is still too moist and soft. If you are struggling to smooth buttercream around the sides, refrigerate the cakes first so they’re slightly firmer and it’ll be easier! 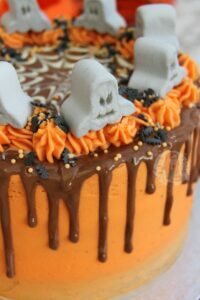 I went for a simple orange coloured vanilla buttercream frosting so it was almost ‘Halloween Coloured’ as Halloween mainly reminds me of the colour orange! 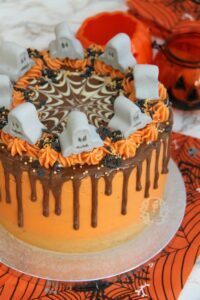 You can easily flavour the buttercream to whatever you prefer, but I used vanilla as I like it with chocolate! I used a mixture of Red and Yellow colourings to make my Orange as it’s all I had, but any gel or paste colouring will work well! I recommend Sugarflair and ProGel food colourings above any supermarket brand as you need so much less, and they’re so good.. they worked perfectly for my Halloween Macarons so! One thing I must say is that I adored doing a spider web style on the top so much I think I put lines through it a little too often… so maybe do fewer lines that I did as mine looks a little spikey! But hey ho.. I found these delicious little Marshmallows from Tiger and the sprinkles in Asda. 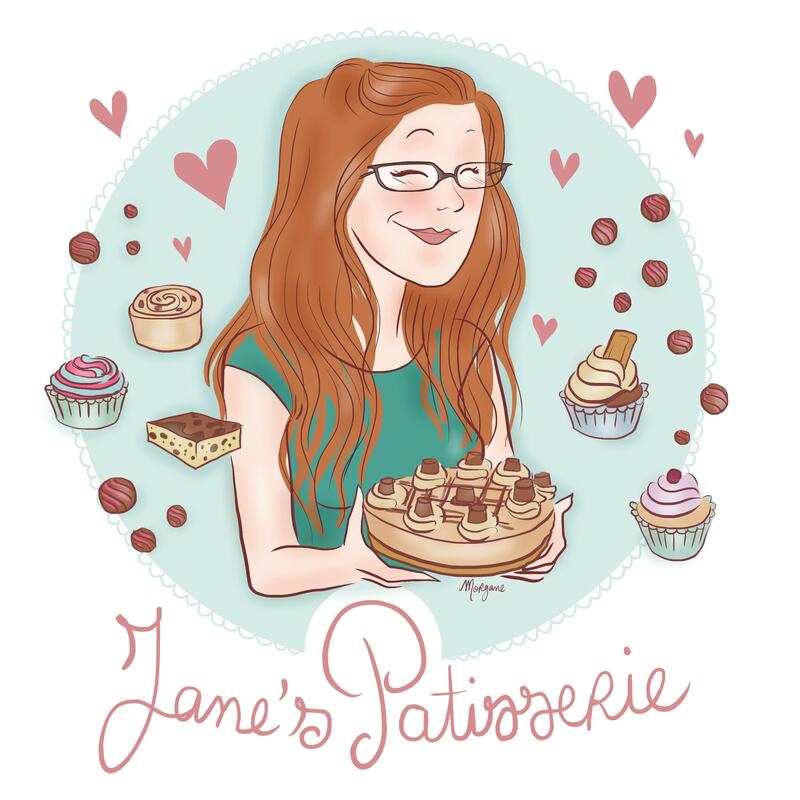 I use Callebaut Chocolate for my bakes but any delicious chocolate will do perfectly! I used the oil method to do the drip as I didn’t have any cream on hand, but you can easily make a ganache for the drip by doing a 2:1 ratio of Milk Chocolate to Cream (use about 200g of milk chocolate). 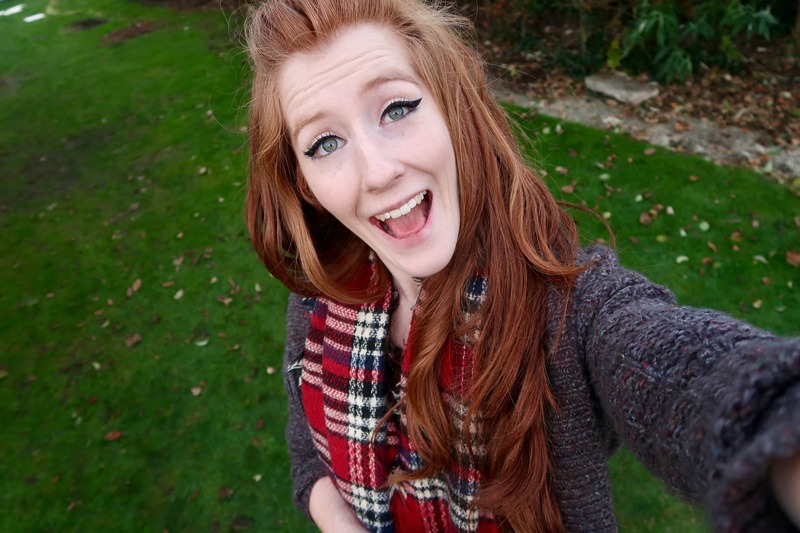 I hope you guys have a suitably spooky Halloween… enjoy! Keep beating the buttercream for a few minutes so it starts to get fluffier and lighter. 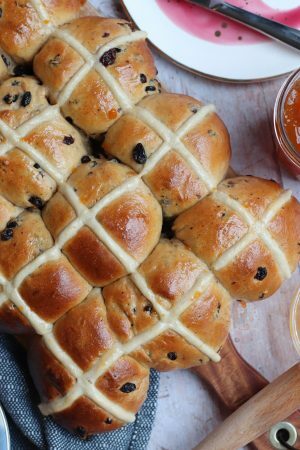 If the mixture is really stiff, you need to add in a tablespoon of boiling water at a time till you reach a smooth, and light consistency that's good for spreading. Add in the Orange Food Colouring (Or Red and Yellow Colouring) and beat the buttercream again till smooth, and there is a consistent bright orange colour throughout. Repeat again with a slightly thicker layer of buttercream. I slather it on all over using an offset spatula, and then run the metal scraper round until its smooth. You put more on than will stay on because when you smooth it over, you will naturally scrape some back off again. Once finished, melt the Milk chocolate in a heat proof bowl until melted. Add in 1tbsp of oil and beat till smooth. I personally only used one tablespoon, but some chocolates might need more. Melt the White Chocolate and drizzle it in a spiral from the inside out, and then run the point of a cake skewer through it from the middle outwards to create the look of a spiders web. Refrigerate the cake for about 10 minutes so the chocolate has a chance to set slightly. 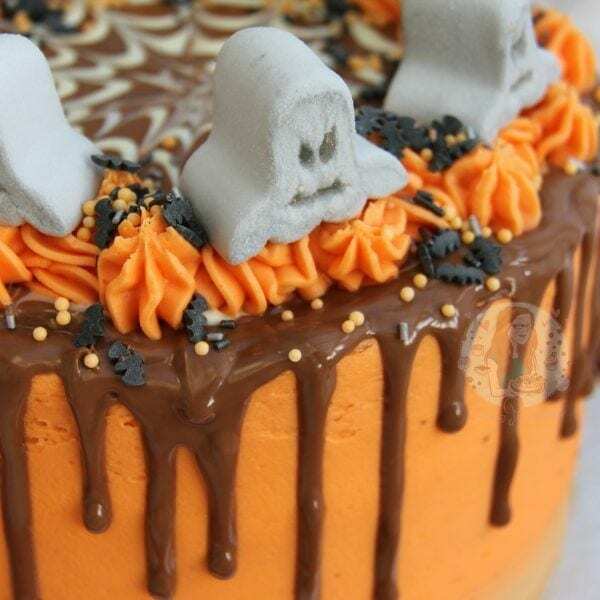 Using some left over buttercream, pipe little rosettes of buttercream onto the top and add a spookily delicious ghosty marshmallow and then sprinkle on some Halloween sprinkles! Enjoy! 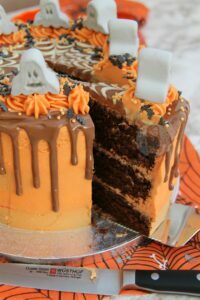 Find my other Cake & Halloween Recipes on my Recipes Page! Older Next post: No-Bake Pumpkin Spice Cheesecake! Newer Previous post: Pumpkin Spice Cupcakes! Hey, I was wondering if the cakes can be frozen (undecorated) and still be okay once defrosted/ taste the same? If they are put in the freezer correctly and thawed correctly they should! 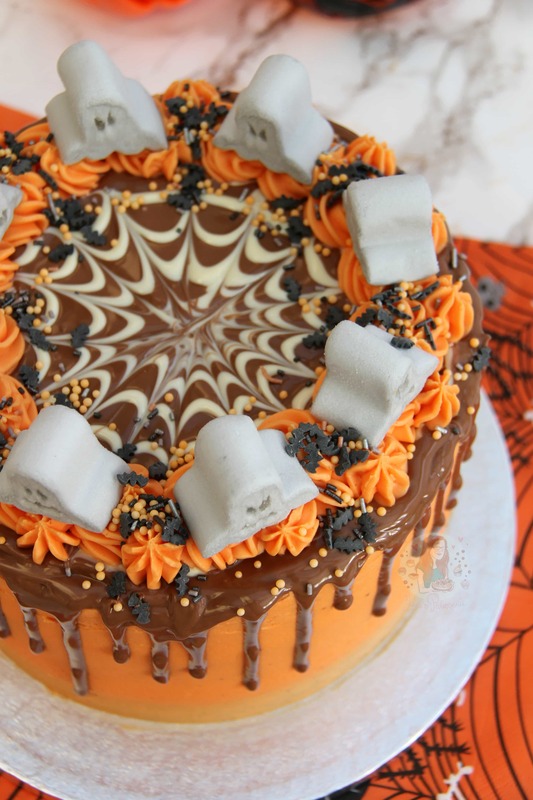 Where do you get your pumpkin & Ghost Marshmallows from? I got them from Tiger last year.